Food allergies are a daily struggle for more than 15 million Americans. To raise awareness about food allergies, the month of May is dedicated to food allergies and anaphylaxis education. However, there are additional risks associated with food allergies other than just allergic reactions. Allergies to foods can increase your risk for tooth decay and bleeding gums. As your dentist in Williamsville, we want to ensure you maintain your dental health when living with food allergies. How Do Food Allergies Impact Dental Health? If you maintain your oral hygiene with proper brushing, flossing, and regular trips to the dentist but still deal with cavities and bleeding gums, the issue could be due to your allergies. Allergies to foods can cause an imbalance in saliva. Saliva is vital to cleansing the mouth to reduce cavities, while also reducing bacteria responsible for gum disease. Although many believe that all saliva is the same, there are actually two different types in your mouth: mucous and serous. Both forms work together to promote your oral health. However, when allergies are present, the levels of saliva become imbalanced. Your ability to produce serous (thin saliva) essentially stops, which only allows the thick mucous saliva to remain. This imbalance occurs because your body goes into a protective mode when responding to an allergen. 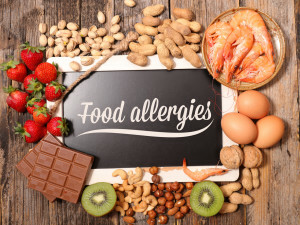 As your body tries to fight the allergen, it causes the thick, acidic saliva to remain in your mouth that traps bacteria by causing it to stick to the teeth and gums. Normally, the thin saliva would wash the accumulations away, but with it is turned off, it allows the bacteria to cause significant damage in the mouth. In addition to the presence of allergens, allergy medications can also lead to an increased risk for tooth decay and bleeding gums from periodontal disease. 80% of allergy medications are known to increase the risk for dry mouth. When the mouth is dry, it lacks the saliva needed to clean the mouth. When you combine dry mouth with improper saliva levels, your dental health is destined to be impacted negatively by your allergies. How Can I Protect My Dental Health? When living with allergies, there are several things you can do to restore the health of your mouth to prevent tooth decay and gum disease. If you are suffering from dry mouth due to allergy medications, there are mouthrinses that are specially formulated to help restore saliva levels. In addition, drinking water will help keep the mouth moist while cleansing the teeth from bacteria. It is important to maintain your oral hygiene routine at home and with preventive dental care to keep bacteria levels in the mouth to a minimum. At Amherst Dental Group, we can recommend several additional steps to help reduce the risk for cavities and gum disease. Where is a Dentist Near Me? If your dental health is being impacted by your food allergies, we can help. We offer effective solutions to protect your teeth and gums from damage. Contact Amherst Dental Group today to schedule a consultation.